The "Mandela Effect" is a subject area that I have sought to avoid writing about ever since I first heard my them room mate refer to it a few years ago [please see above video]. It is my professional opinion that the "Mandela Effect" is a plot by demonic controlled "AI people" who have weaponized alien technology to scramble human dimensions. These same "AI people" having spread the term "Mandela Effect" can then use their operatives in the mass media and elsewhere to blame subsequent real human experiences of alternative realities as simply "false memories" strategically linked to the so-called popular "false memory" of Mandela dying in prison. More specifically, the Mandela Effect has been linked to hideous experiments by CERN in this video and this other video. One scientist in this video who is a self-described clone indicated that humans were not supposed to become aware of the Mandela Effect. This self-described clone alleges that real Earth was destroyed in 2012 as a result of AI directed experiments and that these aliens had sought to create a "Veil" to prevent humans they consider to be "their property" from experiencing discrepant dimensions. However, according to this video a different scientist who disagreed with the veil sought to disrupt it so that humans would notice their experience of a former reality and Earth that us humans know to be our own native space-time. Official history states that Nelson Mandela died in 2013, right? I call the "Nelson Mandela" who became President of South Africa and who died in 2013 "plastic Mandela" for reasons that I will further elaborate. Indeed, African Zulu Elder provided detailed information on ancient African tribal knowledge of human-appearing manipulative alien operatives who would from time to time be discovered by African tribal governments. When I began to investigate the so-called "Mandela Effect" I was rather shocked to learn how so many people including myself apparently had not only a different recollection of history that was stated in "official sources" but brand names of products which remain in popular usage. However, I have noticed that since I first learned about the so-called "Mandela Effect" it seems to be spreading in alarming ways. This includes the apparent alteration of historical events. For example, Mandela Effect researchers now so six people instead of four people in JFK's motorcade just before he was assassinated. Here's further evidence on the original four seat car. Another apparent example of alternative reality shifting also apparent includes such features as the "Great Wall of India" as becoming second in size only to the "Great Wall of China". It was also brought to my attention a hideous looking species of goat appearing out of nowhere which looks like a creature that I might expect to be from another reality. One of the most shocking examples of apparent "reality shifting" that has been brought to my attention though has been "Frogner Park" in Norway which features apparent reptillian aliens overshadowing and eating humans. Based upon Dr Michael Salla's assertion that manipulative aliens "hide truth in plain sight" a casual search links the term Fogner to "reptillians disguised as human salespersons". According to "expert" testimony published in the mainstream media, the Mandela Effect is apparently attributed to millions upon millions of us humans apparently having a "false memory" about actual fact. But such a conclusion is completely absurd. It is apparent that the Mandela Effect relates to humans have REAL experiences of an alternative reality. The cynics who support the Establishment view that the Mandela Effect relates to just how terrible our memories can be as humans will immediately seek to discredit the alternative reality hypothesis by pointing to the "fact" that it has been well documented that Nelson Mandela had died in 2013, and not in prison as many people recall. However, here is where intrigue begins. I remember the fact that during the apartheid era into the 1980's, South African authorities had wanted to release Mandela on conditions that he would not agree to. Mandela had reportedly indicated that we would rather die in prison that to agree to conditions which the authorities imposed against him on his release, and he continued to be adamant even though his health had declined after so many years of being kept in the oppressive conditions of prison life. Mandela was like a South African version of Malcolm X during America's Civil Rights struggles of the 1960's. Some say that eyes are "windows to one's soul". tend to agree with this view. Nelson Mandela's eyes had once betrayed an unswerving commitment to "the struggle" and his presence was an inspiration to every human who he met and he stood out as being against the forces of oppression. And I recall that as a result of his unswerving commitments that he perished in prison under a shroud of cover-ups. In my the eyes of the "resurrected, plastic" Mandela was nothing like the eyes of the Mandela who had refused to give-in. 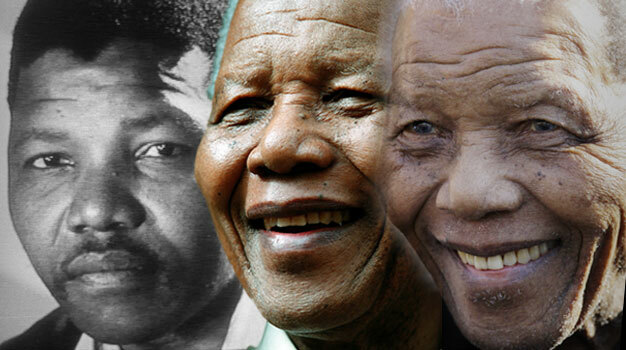 "Plastic Mandela's" eyes reminds me of some kind of doped-up mind controlled "zombie" in a state of perpetuated bliss. When plastic Mandela would talk of a professed commitment to human rights his eyes in my view betrayed the deception of a mechanical intelligence. I call the Nelson Mandela "caricature" who became President of South Africa as "plastic Mandela". And it is this "plastic Mandela" which was used to convince us as humans as having such a poor memory that our minds would "trick" us into believing that we actually had not only heard Mandela had died but also had watched his funeral procession on TV. By scrambling our human experiences of reality and our trust of our own memories associated with those experiences, it is apparent that manipulative aliens are seeking to annihilate our vital human consciousness. The goal of this annihilation appears to be to expedite mass alien abductions through a weakened collective consciousness. As the manipulative aliens alter history and the reality around us they can begin a process of writing themselves into history as the true rulers of humanity which the humans will accept as always being the case at the conscious-level, while also seeking to use subliminal messages to control humans at the subconscious levels. It was the 80's movie They Live which conveyed the kind of control through subliminal messages that these manipulative aliens apparently now seek. One apparent example of this is how an apparent recent new alternative reality has shifted with 'Starbucks' now becoming a rather long "Starbucks Coffee" with a logo which seems to be modified somehow in a manner which seems to be conveying a rather disturbing message. Do you remember that huge star on top of the Starbucks logo like that? One owner of Starbucks noticed the overnight change of his store's signage and was so disturbed by the new sign that on his own he changed back the sign to its original state. I had noticed for a week that the "Starbucks Coffee" signage seemed out of place but at first I dismissed it as some new "corporate makeover". However, when I noticed that the signs all seemed to be "aged" to match the original ages of the Starbucks at various locations, it seemed evident that this indeed was another "Mandela Effect". How many people do you know ever said "Let's meet at 'Starbucks Coffee'". In the reality where we only knew of Starbucks, the idea of a labelling this trendy chain "Starbucks Coffee" would be ludicrous. The name has become so ludicrously long that the Starbucks logo which used to fit snuggily beside 'Starbucks' has been placed in all sorts of seemingly awkward positions on its own by itself, like an after-thought. But much more disturbing is the report that I received that just after many humans experience the initial shock of hearing evidence about the Mandela Effect that they have been observed to be acting as if information was being "downloaded" into their minds to create an actual false memory that a certain reality anomaly "always existed". The apparent "plastic Mandela" who became South Africa President acted in a manner completely against all that the Mandela in prison had sought to defend. It is my opinion that "plastic Mandela's" eyes can be described as being similar to a zombie and that was manifested in that plastic Mandela willfully being a complete operative of crony capitalism in the name of "Reconciliation". "Plastic Mandela" the overwhelming majority of black South African in an utter state of social economic turmoil under the same kind of corrupt black leaders that the Mandela in prison was determined not to support and I was part of a movement that was on the cusp of South Africa becoming a "black Sweden". The entities responsible for the on-going oppression of black Africans were determined with their apartheid allies for that not to happen. When I speak to black South Africans, most say that they indeed became economically became worse off when "plastic Mandela" became President. This would have never been the legacy of the Mandela who refused to give in to white pressure for so-called compromise. Would Mandela all of a sudden become a sell-out when he was released? I was part of a well-organized group who had sought to assist Mandela and his progressive supporters in making South Africa an African version of Sweden that would become a source of inspiration for not only the whole of Africa but for members of the African diaspora everywhere. There have been more and more reports of families having experienced a different reality with each other. In published reports when such representations have surfaced, they have all been attributed to so-called "false memories" linked to the publicly presented example of the alleged false memory of Mandela perishing in prison. At one of my favourite restaurants I have always seen three prominent chefs in their open kitchen. I like to sit at the bar and watch them as I dine. Well two weeks ago when I went there, all of a sudden I see a fourth chef who I never seen before who says to me "Welcome back!" Then I think to myself, "Welcome back?!" I had never seem this chef ever before and I sometimes go to this restaurant three or four times in one week. Is this another "Mandela Effect" example of altered dimensional experiences? Recently, just a few days ago, I ran out of a cereal I like and went right to the bottom where only fine crumbs were left. Next day I decided to get more of that cereal. When I returned to place the new box into the only small cupboard that I keep cereal, right in front was a box of the same cereal about 25% full. Last week I saw a whole building complex not there anymore. I heard an older couple who was passing it the same time as me say, "funny, I don't even remember what building was there before." It appears that the manipulative alien technology that was used to replace the Mandela who refused to surrender to authority with "plastic Mandela" may have been harnessed. The apparent result of this harnessing may be attempts to weaken the fabric of reality as part of an effort to expedite an alien controlled "New World Order".